Be on-trend in this satin short homecoming dress for a family celebration or school dance. 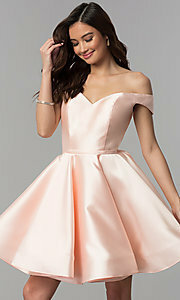 This little party dress features a structured sweetheart bodice with sultry off-the-shoulder sleeves. With a spin, this short dress reveals a lace-up corset back. For a covered-up look, a modesty panel snaps into place beneath the corset detail. Flaring out from the natural waistline to a shape-keeping horsehair hem, the full satin circle skirt gives a flirty vibe to this short homecoming dress. 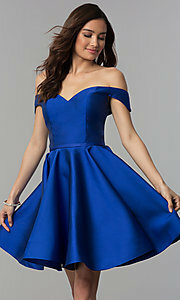 Under $200, this off-the-shoulder hoco party dress is offered in misses and plus-sizes for semi-formal events.